Since 2011, a few of us had been singing in a commercially-run choir, led by Charlotte Eaton. 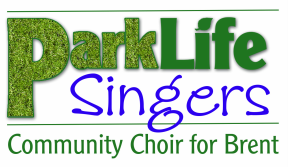 In March 2013, we all decided to have a go at setting up a community choir based in Brent, and so ParkLife Singers was born! co-operative, so the more members we have, the lower we can make the fees. Members can get as involved as they like in running the choir and choosing the repertoire – but if you prefer to just turn up and sing, that's absolutely fine too. Our Creative Director is Charlotte Woodford; musician, social entrepreneur, laughter yoga teacher and all-round inspiration! Open to all – everyone is welcome: complete beginners or experienced singers, young and old, male and female. When to join It's best to join at, or near, the beginning of a term; but you're welcome to come along any week until the half-term break. (After that, it becomes difficult to pick up the songs as we are working quite hard towards the end-of-term performance). Our members range in age from people in their 20s to those in their 70s and beyond. We don't hold auditions or read from sheet music. As long as you love to sing, you can take part. We sing songs from all over the world, across the ages, and in different languages. Some songs you'll know and many won't be familiar. We sing three- or four-part harmonies and some rounds. Each term we prepare a set of songs for performance; usually a mixture of tunes new to the choir and favourites from earlier terms. Learn by rote – we provide recordings of the separate parts, either as downloadable files or on CD, so that you can practise at home. Excellent tuition & lots of laughter – choir rehearsals are a lot of fun and very warm and friendly. Aside from creating a great atmosphere for learning, this is essential to making a beautiful, connected and cohesive sound. When people are relaxed, they sing in tune more easily. Singing is proven to have huge health benefits, both physical and mental. You can make new local friends, improve your musical ability and feel those endorphins flow!